No longer a traditional SUV, today’s Dodge Durango is trying to be something unique in the marketplace: half utility vehicle, half muscle car. Particularly when you outfit it with a HEMI V8 engine, the Durango takes on a personality that’s dramatically different — and more fun for driving enthusiasts — than other family-friendly vehicles in this price class. Yes, you can find this kind of performance in German SUVs like the Porsche Cayenne and BMW X5, but they cost at least $55,000 to get in the door of their most stripped-down, least powerful flavors. My fully optioned, 360-horsepower Durango, complete with a rear-seat DVD entertainment system and custom-looking red leather interior, rang up under $46,000. Even the base Durango, priced at $30,495, is no slouch with a 295-horse V6 and a suspension tuned to let you enjoy it in corners. Both its power and handling are impressive in a market segment where those aspects are typically mediocre at best. What are the tradeoffs? Fuel economy and interior quality. With a lower ride height, better handling and more power than most family-friendly SUVs, the roomy 2016 Dodge Durango plants a decidedly sporty flag in the market. My V8-powered Durango was rated for 14 mpg in the city and 22 on the highway, numbers more reminiscent of 1996 than 2016. The V6 is more reasonable, with up to 27 mpg on the highway, according to the federal government. And the interior, while it drew plenty of attention for its stunning and sporty red color, just didn’t feel as tightly assembled as some of its recently redesigned competitors. Really, though, no one buys a Durango for the gas mileage or the dash construction. They buy it for what it can do and how it makes you feel. From a utility aspect, this SUV shines with three spacious rows of seating and a voluminous cargo hold in back. It even has some truck-like capability with up to 7,400 pounds of towing, enough for serious weekend warriors. Any big, traditional SUV should be good at those things, though. 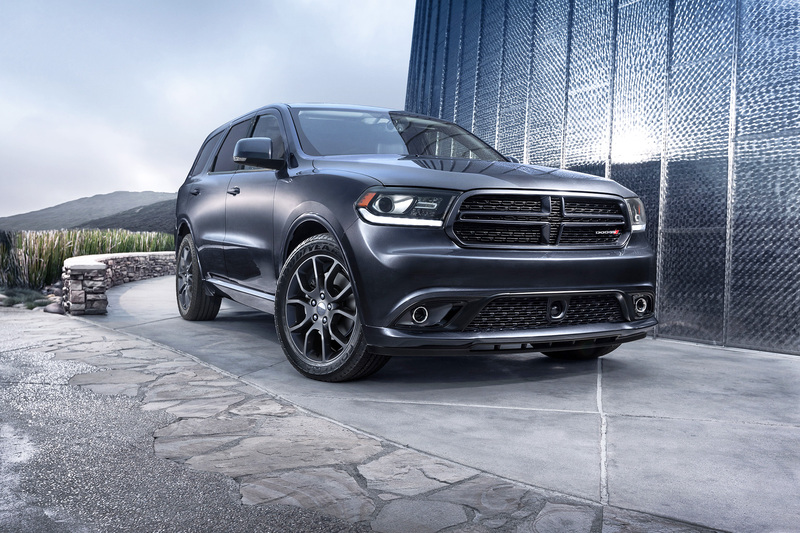 What sets the Durango apart is its lower ride height and a driving feel that mimics a muscle car much more than it does a pickup truck. It hugs the road and changes direction with poise, all thanks to its low-slung body and car-like suspension. While it’s largely a carryover model for 2016, there are a few changes to keep things interesting this year. 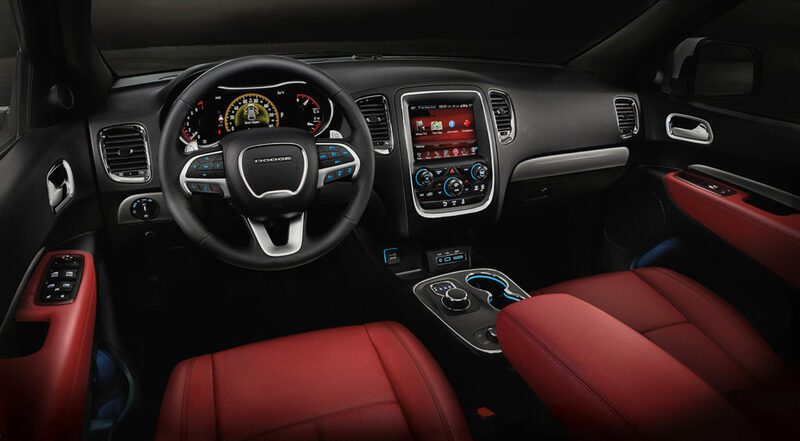 An optional red leather interior gives the Durango an outgoing, sports-car-inspired look for its cabin. The engine on all V6 Durangos adds start-stop technology that will shut it off when you come to a complete stop to save fuel. It’s something hybrid cars have employed for years, but it’s starting to make sense in non-hybrids, too, where every drop of fuel savings can make a difference. Exterior changes include a new Brass Monkey Appearance Package with 20-inch bronze-look wheels, a monochromatic style for the Citadel models, and four new paint colors to choose from. In addition, a sport mode is now available on all models to make it more responsive to driver input when you want it, and there are upgrades to the 8.4-inch Uconnect touchscreen system that make it easier to steam music from your smartphone. While I’m a huge fan of Apple’s CarPlay interface, something not available on the Durango, Uconnect is one of the easiest digital systems to use that’s not made by Apple or Google. Uconnect is not as slick looking as CarPlay, but its “plug it in and it works” simplicity is very well executed on the Durango. When equipped with the HEMI V8 engine, it’s thrilling to drive and almost as capable as a pickup truck, with a giant cargo area and 7,400-pound tow rating.